So again I’m copying an idea from Expat Mom. She did 57 random bits, which I’m not sure I can achieve, but I’ll try. Here we go. 1. I pretty much always read the last page of every book I’m reading, just to make sure it has a happy ending. 2. I watch movies and read books for a happy ending; non-happy endings annoy me. 3. I worry constantly that I’ll let my family down. 4. Sometimes I feel like I’m still in the preparation stages for life, that it hasn’t really started yet. But I just turned 27, so….maybe I should get started on that. 5. I’m afraid I won’t accomplish anything great. 6. I don’t watch scary movies because I get really anxious and scared, and why would I want to put myself through that?! 7. Most of the foods I dislike are because of texture: shrimp is chewy, mushrooms are slimy. Ick. 8. I’ve never dyed my hair. 9. The craziest thing I’ve done to my hair is to get it layered. 10. Other than mascara, I don’t really know how to use/apply makeup. 11. I was in choir in high school. 12. I once thought I wanted to teach chemistry to high school kids. Insanity! 13. It’s hard for me to find a balance between my white half and my hispanic half sometimes. 14. I sometimes get the feeling people don’t like halfies like me. 16. I’ve printed out a couple lists of the 100 or so books you should read before you die. I’d like to read all the books one one of those lists someday but haven’t made much progress. 17. I check my email and facebook too many times a day to count. 18. I like and enjoy going to church when I don’t feel like I HAVE to go. 19. I think I’m very patient, but maybe I’m not in reality. 20. I stress out every time I’m cooking: I always think it’s going to taste terrible. 21. I’ve started baking cakes for everyone’s birthday. I like it. 22. I fall asleep more easily with a pillow on my feet–I owe that nice quirk to my mother. 23. My grandmother is my hero. It scares me to think of life without her. 24. I wish I was more assertive. 25. In high school and college, I was an avid taker of pictures and maker of scrapbooks. I always wonder if I’ll ever go through my scrapbooks with my kids someday. 26. It’s weird for me to be in a position now where I can ask people to do things for me. I’m used to being the one being asked to do things. 27. I think I’m the luckiest girl in the world to have someone love me as much as Jeff does. Sometimes I feel I don’t show him enough how much I love him. 28. I’m starting to run out of things to type. 29. I almost went to college in Guatemala, but they don’t have financial aid over there and I couldn’t afford to pay for a private college in Guatemala. 30. I always wonder what my life would have been like in Guate if I had never moved back. 31. I miss going to buy tortillas for lunch everyday. 32. I’ve always wanted to live somewhere else, but I don’t think I ever will because I’m too scared to do it. I actually pictured myself living in a little house in the country like Belle from Beauty in the Beast (the opening scenes). 33. I love Mulan but haven’t watched it in years because I’m afraid people will make fun of me. 34. I repeated kindergarten, but caught up when I moved back from Guatemala. 35. I had an imaginary game in kindergarten every time I was on the swings (it was always the same game). 36. Growing up, I never felt like I fit in with my family. I used to hide in the bedroom during Christmas until it was time to open presents at midnight. 39. I didn’t have my first email account until my senior year in high school, and only because Mr. Garber told me I had to have one. 40. I always feel like I’ve cheated my way through things, mostly because I lack confidence in the things I do. 41. I get excited about having new office supplies. Ordering supplies was one of my favorite jobs as a legal assistant and sometimes wish I could still do it as an attorney. 42. I’m excited about increasing our collection of Christmas decorations (and Halloween…and Thanksgiving…). 44. I wonder if I’ll ever meet my dad and his kids, although deep down I’m pretty sure I never will. 45. I helped organize my college graduation ceremony (the Chicano/Latino version). 46. I went to law school knowing I didn’t want to be an attorney. 47. I hate debating people. I shy away from controversial topics because I don’t think I can convey my opinion clearly (probably why I never wanted to be an attorney). 48. I had a little pink stereo when I was little. I brought it into the bathroom when I showered and listened to K-Earth 101. 49. I can clearly remember the only time my mom spanked me. 50. I don’t understand people who are rude. It’s so easy to be nice and so much more rewarding. 51. I’ve always wanted to have an amazing body, but always too lazy to get it. 52. Oh my goodness I’m almost there (and I’ve only cheated on 3!). 53. I’m embarrassed about some of my music collection. 54. Sometimes I feel like I’m not emotional enough about things and it freaks me out. 55. I was freaked out about the world ending in the year 2000 when I was eight. 56. My worst grades in junior high and college were both math related. 57. I was president of my classes in Guatemala and tried to do the same in high school…a class of 40 girls who like you is way easier to win over than a class of 200 who don’t even know you. I wrote 57, and you read to the end. Congrats to us both. 1) So on the extradition of Guatemalan ex-president, Alfonso Portillo: it seems like the United States is actually going to issue an extradition order. But isn’t it curious that just as a US court is preparing the paperwork for his extradition, he gets sick and has to be hospitalized! Ahhhh what a lucky coincidence! 2) Some of you might remember Jeff’s car getting flooded. For those of you who have been sitting at the edge of your seats wondering what happened, wait no longer! The insurance actually considered it a total loss, so they paid off what remained on the loan, and gave us the difference of the value. It’s actually been a blessing in disguise. The only reason we’re ok with the situation is because Jeff’s been using his brother’s car (who’s in Germany, so no need for the car…), so we didn’t have to worry right now about buying another car. The money we got is probably going towards paying off some credit cards, but for now it’s been great to have some cushion money in our account and not have to freak out about having enough for rent or something. 3) On the work front, things are getting busy. The workload is endless, which is good. We’re trying to make sure cases get pushed through so we don’t just have them stacking up somewhere, but it’s a lot harder to do than you would think! What’s frustrating is that the second I think I’ve got a file I can complete and file, there’s some random little issue with it and it has to sit on my desk for another few days until I figure out where to go from there. I guess I’ll either figure out how to solve those little problems, or get used to have tons of files on my desk. There’s a song that states: “sometimes I thank God for unanswered prayers.” I was thinking about that on my way home tonight. See, the job that I really wanted out of law school, doing public interest work, would be paying me about half of what I’m making now. To give you an idea of how much I wanted this job: I actually cried when I didn’t get it, Katie (whom I was studying for the bar with at the time) brought me flowers and a card telling me I was still amazing, and Jeff dropped what he was doing to join me at Starbucks and tell me everything was going to be ok, life would keep going, and other jobs were out there. Now that I’m working and making decent money, but still barely getting by, I think: how did I possibly think I was going to make a living off of the salary they were offering me?! This job has also introduced me to some pretty cool people (which I think will be a blog of its own). There’s been a constant stream of new people lately, but I think we’re all getting comfortable with each other and becoming slightly more like friends than just co-workers. So although it wasn’t what I was expecting, I think it’s been a blessing in disguise as well. Stayed tuned for further updates! This first one has been coming up alot on my Mana mix lately, so I thought I’d share this one with you all–Manda Una Senal. I think this might have been one of the many we played at our wedding–Como te deseo. Finally a video that actually worked! I’m not sure were it came from or how it started, but I’ve always had it. I can clearly remember being six or seven years old, walking down the aisles of stores or Price Club (that’s right, old school), seeing a typewriter and later computers, and feeling the need to touch the keys. It became a thing. Every time I saw one somewhere, I had to type something on it. Not just anything. My mom’s full name. A-S-T-R-I-D-D-E-L-C-A-R-M-E-N-B-E-L-T-R-A-N. Weird, I know, but I HAD to do it! 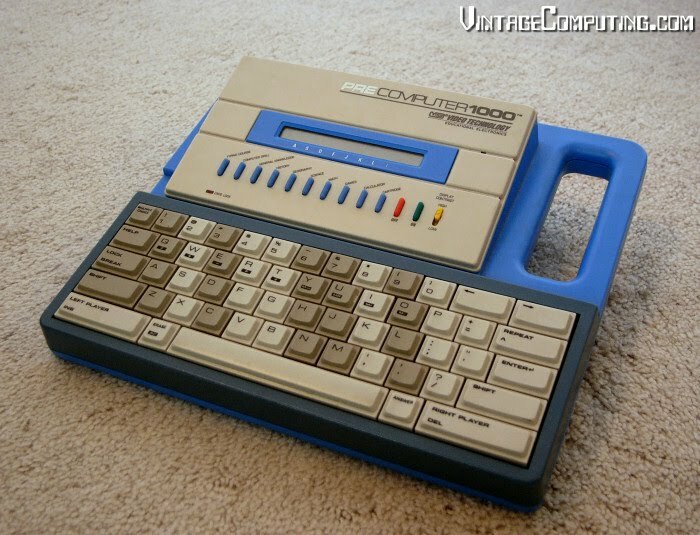 Around the age of 7 or 8, my mom gave me what I think was my favorite toy EVER: the PreComputer 2000. In researching for this blog, I could only find an image of the pre-precomputer 2000. This baby taught me how to REALLY type. Legit: all fingers on the keyboard, not the two-finger-peck. The PreComputer had all sorts of educational games for vocabulary and math and what not, but I mostly just played the typing game. The first level would start with just a line of individual letters scrolling from right to left, and you had to push the corresponding key before it got to the left side and disappeared. As the levels went up, the letters became words, they threw in upper case and lower case (that was a biggie), and they started to go faster and faster. I’m getting all giddy just remembering how much I loved this game!! At the age of 9, my mom and I moved to Guatemala to live with my grandma. My uncle Franky was probably about 15 or 16 at the time, and a couple afternoons a week he would walk up the hill from our house to the typing school. Yep, a typing school. My dream come true! haha. I remember walking by the school holding my grandma’s hand, on our way back from the mini-market or the meat market, and looking at all these 15 and 16 year olds sitting in front of typewriters, typing away. I’m sure the last thing they were doing was actually being productive, but still, I was soooo jealous! I remember seeing some of Franky’s homework and being amazed: they made all sorts of designs and drawings with the different letters and numbers (ok, maybe that was just Franky and at the time I thought he was actually doing his homework, but still). I couldn’t wait to be old enough to go to my typing class. I remember going to a relative’s home and their son was typing some sort of report or something on the typewriter, and I was just watching him type (can anyone say creeper?). He asked me: do you know where you should be looking when you’re typing? The keys, duh. I was flabbergasted when he said no. The screen? No. Huh. That was when I learned that you should be looking at whatever it is you are copying from, and therefore, you have to have every key location memorized! Unfortunately, we moved back to the States when I was 12, so I never got to take my Guatemalan typing class, but I still learned to type. And I still love to type. The faster the better. Jeff’s mom always makes me feel good about myself when she comments on my typing, and Jeff just laughs whenever I’m typing on my blog: he said it sounds like there’s no possible way I’m typing coherent sentences. Years of training have paid off! Many of you may have heard of a bestselling book a few years ago, “Three Cups of Tea.” I bought it online after seeing a random add for it in the online version of the LA Times. It seemed like something I would like. I’ll admit that the first few chapters were a little tough to get through, but once I got passionate about what this one man was trying to do, it was difficult to stop turning the pages to see if he was able to accomplish it! His idea was that what was needed in the Middle East was education, a lot of education. Greg’s main beneficiaries were girls who had so far been forbidden to go to school. Greg’s goal was to raise money to build schools for these girls, in remote villages in Pakistan and Afghanistan. These projects are all accomplished with the help of local community members: money is raised, but labor is provided by the parents of the children who will one day attend the school. His book talks about the difficulty he had in raising the initial funds for his project and how it took off. This is where the Central Asia Institute (“CAI”) comes in. It’s a 501(c) nonprofit created by Greg to fundraise money to continue building schools in the Middle East. Since it’s inception, CAI has expanded its programs to include programs for women, to help them make money to support their families, and also sustainability for many of these villages who have never had running water, etc. I encourage everyone to check out CAI’s website and to read the book. I encourage all teachers out there to look at the Pennies for Peace program, where school children can have a direct impact in fundraising and building schools for less fortunate children across the world. Please let me know if you have any organizations in mind for next month’s Charity of the Month! I discovered Imogen Heap through Jeff (shocker! ), when we first started dating. She’s amazing. I’m posting several of her videos because I like each one for different reasons. This first one I like because it’s an official video and I just love the style of how she does things. For those random readers who don’t know too much about me, I come from a single parent home. Whenever people find out about this, they feel like they need to apologize for some reason. Thing is, I never met my dad, so there isn’t much to apologize for. Unlike those of you who lost a parent through divorce or death after having them in your lives for years, I’ve never known what it was like to have a dad. So how can I know what I’m missing out on? I never thought much about what I thought as a child, and how that affected my mom. In my mind, I’ve always been comfortable with not having a dad around. A few months ago, however, my mom was cleaning out some stuff and she showed me a drawing I made when I was in first or second grade. It broke my heart to think of how much that drawing hurt my mom. I forget exactly what it said, but I had drawn a house in the shape of a heart, and I had drawn myself and my mom, along with a “dad.” I had written a caption on it to the effect that a family isn’t complete without a dad. Yikes. Looking at that picture as an adult thinking of starting her own family soon, my thoughts were not towards what I felt when I drew that picture, but what my mom felt when she saw that picture. Thank you mom for never giving up, no matter how difficult or hurtful the journey. I have always wondered when it would happen. Although my mom and my aunts are satisfied with their jobs, I’m pretty sure it wasn’t what they dreamed of doing or being. I’m sure when they were younger, they had dreams and aspirations of what they wanted to achieve with their lives. Personally, I think they’ve all achieved amazing milestones, each of them raising children through varies adversities in life, buying homes, maintaining relationships, etc. My focus here is more on career/professional dreams rather than personal or familial. When I was in second grade, I remember an assignment (which I’m sure we all had at some point) where you had to draw yourself as what you wanted to be someday. I drew myself in a camouflage uniform (my uncle was a marine). I can still picture that drawing. Needless to say, that dream only lasted as long as it took me to realize that I would never be able to run a block without losing my breath. Then I moved on to becoming a teacher. I think this one lasted all the way through highschool. I was fascinated by chemistry and biology, but I never thought I would be able to effectively explain these concepts to a classroom full of children. So I left that one aside. I’m glad I did this because once I reached college and met people that were actually pursing science degrees, I knew I would have never made it! From high school on, I was fascinated with diplomacy and international relations, and international non profit organizations (focused on human rights and democracy). That one has stuck around for some time now.